As we reflect on another New Orleans Jazz & Heritage Festival, it can seem ironic that such an ecstatic event could have been an indirect result of one of history's most horrific episodes: the Atlantic slave trade. Without the forced interaction of such diverse cultures there would be no jazz, blues or rock music as we know it today. In 2014, the newly restored Whitney Plantation in Wallace, Louisiana opened as the first American house museum to reveal what plantation life was really like. 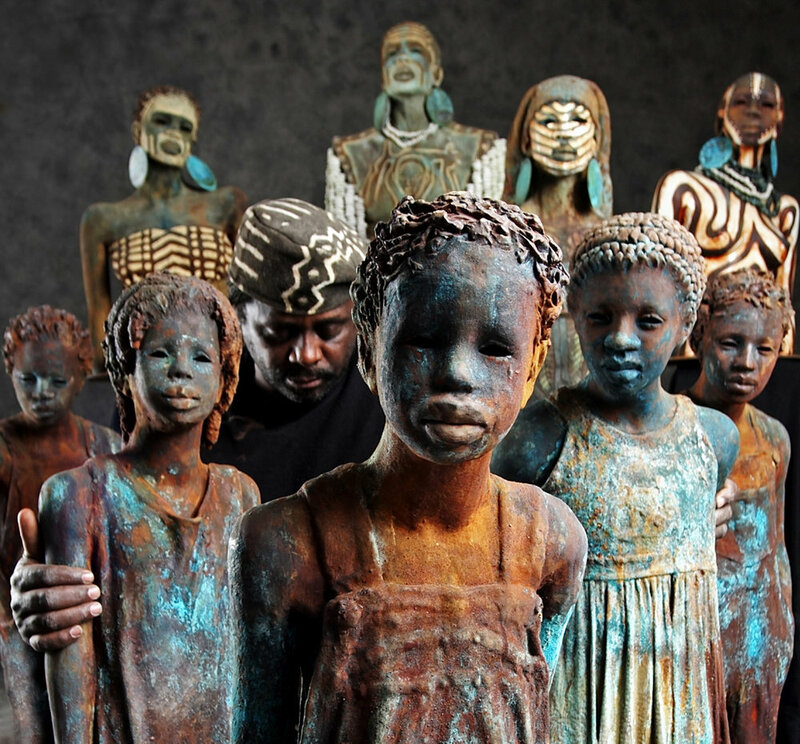 Among the historic displays are some startling contemporary clay sculptures by Woodrow Nash. Perhaps the most haunting are some life-size children who turn up in various settings like side characters in Mark Twain stories. Unlike other such museums, the Whitney elucidates the harshness of plantation life, a brutality made all the more unnerving by the vulnerable innocence of Nash's children. A more varied array of his works on view at the Angela King Gallery includes some sinuous lifelike figures inspired by 17th-century African styles of dress and adornment. Although rendered with hints of art nouveau and Matisse-like flourishes, their presence is as elemental as Africa itself, and the colorful glazes seen in a view of the artist and his creations (pictured) reinforce that sub-Saharan aesthetic. For instance, a sculpture of a tall, slender woman, Almitra #9, conveys the lithe grace of a Masai princess with large copper disk earrings and vibrant African fabric patterns underscoring her regal aura. A bust of a male warrior, Husani #4, sports a white glaze reminiscent of the pigments used in tribal rituals also, while highlighting the patterns etched into most of the adult figures — incised designs that suggest scarification but also probably help them survive the intense heat of the ceramic kiln. At the entrance to the gallery, a cluster of Nash's ceramic children recalls old New Orleans' ever-present street urchins; it doesn't take much to imagine them as the young Louis Armstrong's ragtag friends and playmates.